Similar Amazon Product Types? Grouping for Tax Treatment? In A2X we provide different options for the grouping of Sales, Refunds, Promotions, Shipping and Giftwrap charges. We also have a Grouping by Product Type option. In this post we’re going to show you how grouping by product type works. I’d like to say upfront, product types are generally an 'extra-for-experts' setting that not all users are going to want or need, it lets you group many different SKUs into single line items for special accounting or tax treatment. Let’s assume we have 100’s of different sizes and colors, but we need to track them by brand, perhaps for tax reasons or for accounting reasons – for example we split brand sales in our profit and loss reporting. 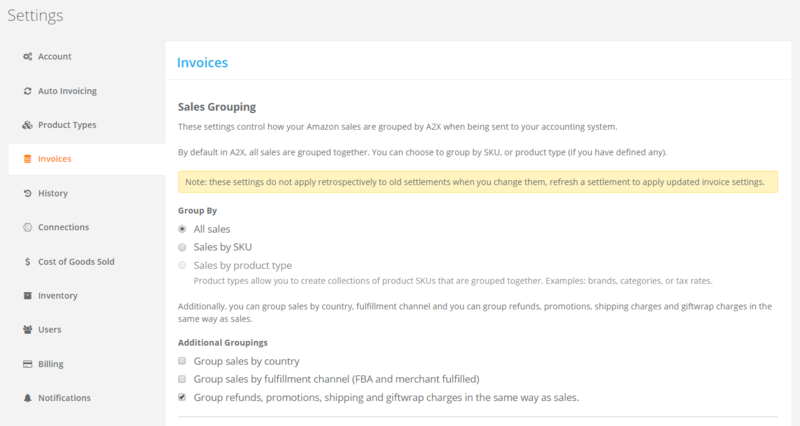 There are two steps to use product types grouping in A2X. 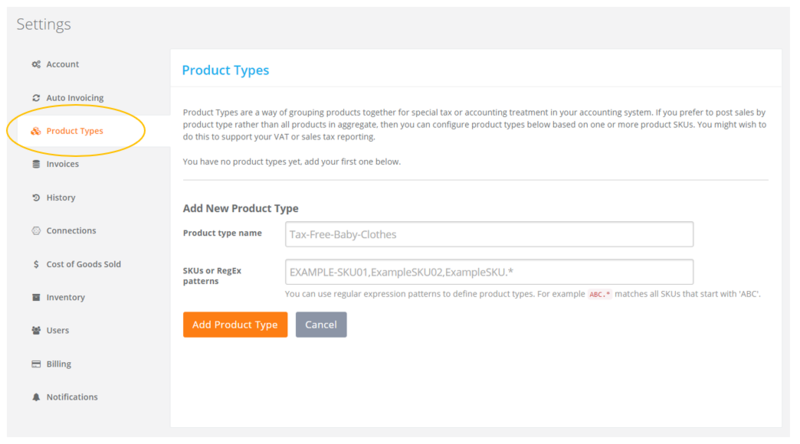 Log in into your A2X account, go to 'Settings' in the main menu and then select Product Types as shown below. define a Product type name – we might use our brands to continue our example from above: ‘COOL’ or ‘FUNKY’. Instead of listing every SKU separately, we can also use a regular expression pattern to match all the SKUs of a type. Regular expression patterns allow us to create special patterns of our SKUs to save maintaining lists as we add/remove SKUs from the catalog. For example, if we have 20 different colors of T-shirt, we could group all the small sizes together using a pattern like “TSHRT-.-S” (where the “.” means match anything in the middle). More information about regular expression patterns is available here, if interested – it’s useful for very advanced use cases. If we need to add SKUs or patterns to certain Product Type, we can do so by clicking on “Edit” button beside it, or we can delete entire Product Type by clicking on “Delete” button. Once we are finished adding Product Types, we can move to the menu on the left and click on “Invoice Settings”. Choose the option “Group by product type” and click on “Update Invoice Settings” button. Please note, that once we change the A2X invoice setting, we need to refresh each settlement we wish to post to reflect the new calculations. There are lots of different reasons, your financial adviser or tax adviser can help you choose when it is appropriate. One example where A2X users use this option are baby products in UK. They are VAT exempt, so they get pulled out and accounted for differently on the invoices. Some users also use this option to track broad categories of products in their P&L reporting for management. The “Group by Product Type” option works well if we have consistent formatting in your SKUs or a SKU list that’s not changing too often.